Hello there stampers and Happy Sunday! We've been having some bizarre weather here in CNY lately and today was no exception. Snow and wind have been the order of the day, so needless to say, I used that as my excuse for hanging out in my craft room today and one of my fun creations comes from the 2017-2018 Annual Catalog. This time of year we have a tendency to forget about all of the awesomeness in our Annual Catalog because we're so focused on the Occasions catalog and getting ready for the new annual catalog to come out. So, today, I wanted to give our current catalog some love. I pulled out the awesome Orange Blossom stamp set and some of our soon to be retiring, amazing 2016-2018 In-colors! To create the background, I randomly stamped the flower blossom in Peekaboo peach, making sure my pattern was random; and the secret to a good random pattern is to make sure some of the images literally fall off the page as you are stamping them. I then added some random leaves using Emerald Envy ink followed by some random Flirty Flamingo "berry clusters" onto a piece of Whisper White cut 2 1/8" x 5 1/2". I layered this piece onto a piece of Peekaboo Peach cardstock cut 2 3/8" x 5 1/2" and adhered this panel to a standard card base of Flirty Flamingo. 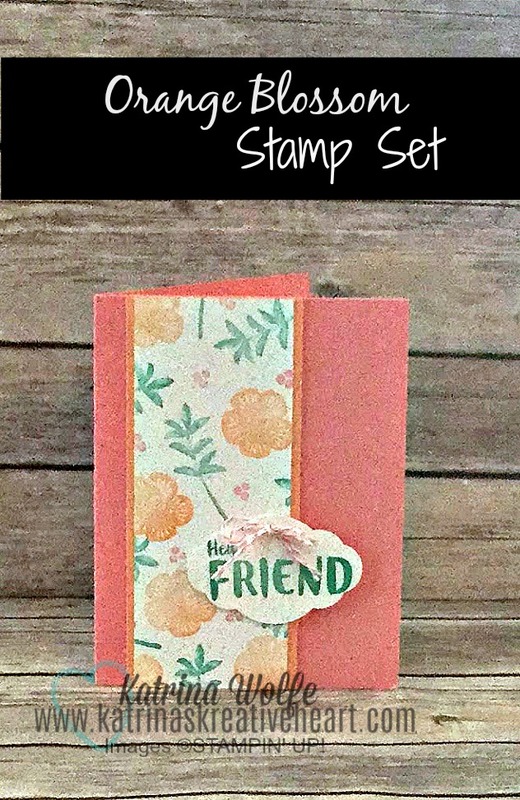 I stamped the "Hey Friend" sentiment from the stamp set in Emerald Envy ink onto a scrap piece of Whisper White and punched it out using the Pretty Label punch and popped it up on some Stampin' Dimensionals and adhered it to the card. I made a bow out of 2 strands of the Flirty Flamingo Bakers Twine and adhered this just above the sentiment using a mini Glue Dot. Again, this card is quick and easy and I truly hope you enjoyed it. 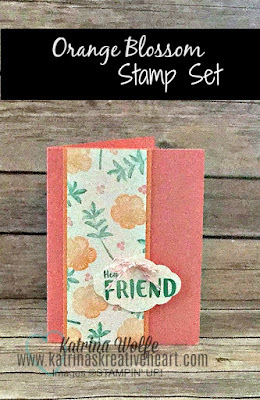 If you enjoy quick and easy card tutorials such as this, please join my newsletter by clicking here. Please leave a comment and let me know your thoughts on this card. I love to read your thoughts. Thanks for stopping by and I wish you an amazing evening.